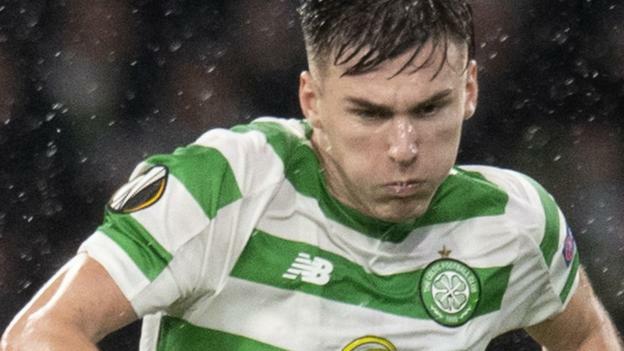 Celtic will continue without left-back Kieran Tierney when Valencia visit on Europa League duty on Thursday. Absent since mid-December with a hip complaint, the 21-year-old is back in training but will not be considered for the first leg of the round of 32 tie. Emilio Izaguirre missed Sunday’s Scottish Cup win over St Johnstone with an ankle knock but is fit to return. Fellow defender Jozo Simunovic is available after being withdrawn at half time feeling ill at the weekend. Midfielder Olivier Ntcham has suffered a recurrence of a hamstring complaint and joins Filip Benkovic, Tom Rogic, Eboue Kouassi and Anthony Ralston on the sidelines. Brendan Rodgers’ side have won all seven matches played in 2019, without conceding a goal. But Celtic have never advanced beyond the round of 32 in the Europa League after defeats to Inter Milan (2015) and Zenit St Petersburg last year. “We are at the best level we could be at in terms of the start we have made to the second part (of the season) and also to the level of our game,” said the manager. “The intensity is at a really high level and irrespective of our opponents that is what we always try to achieve in the game, in terms of pressing the game and playing at a really high tempo and have that throughout the 90 minutes. Valencia, who finished third behind Juventus and Manchester United in their Champions League group, are eighth in La Liga. The visitors have reached this stage of the competition on four occasions, going through each time. Argentina defender Facundo Roncaglia is suspended for the Spanish side, while Jose Luis Gaya and Rodrigo Moreno have joined a long injury list. But the visitors were able to welcome back former PSG and Benfica winger Gonaclo Guedes as a second-half substitute after two months out with a groin injury. Rodgers described Valencia as “an outstanding team”, adding: “They are not used to losing, they have only lost four (league) games this season so the mentality is to win. The clubs met in the third round of the Uefa Cup in 2001-02, with both sides winning 1-0 at home and Valencia prevailing in a penalty shoot-out in Glasgow. Valencia also triumphed in the first round of the 1962-63 Inter-Cities Fairs’ Cup, 6-4 on aggregate, with the Spaniards going on to retain the trophy.